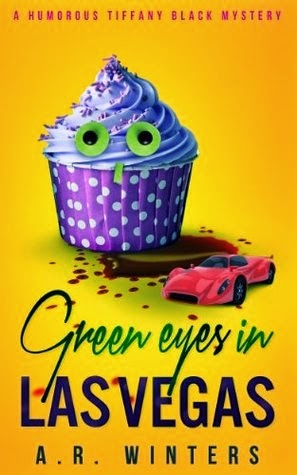 From Goodreads ~ When cupcake-loving croupier and private investigator Tiffany Black witnesses a handsome, green-eyed man making a getaway after an art heist, she finds her normally chaotic life becoming even more complicated. Tiffany flits between her two new cases: investigating the missing Van Gogh and the murder of a Hollywood starlet with a secret life. When her investigation takes an intriguing turn and a man with mesmerizing green eyes comes into her life, Tiffany starts to wonder if this man might be the missing link between both crimes. When her octogenarian friend, Glenn, starts dating a very inappropriate woman and Nanna starts calling a twenty-something-year-old her “boyfriend”, Tiffany wonders if being attracted to a potential criminal might not be so crazy after all. As she follows the investigation from movie sets to museums, danger strikes a little too close to home when Tiffany discovers that not only was the dead girl being stalked, someone with a deadly motive appears to be watching her too. Tiffany is walking home from her job at the casino late one night when a man dressed in black with green eyes lands in front of her via a parachute carrying a poster tube. Then he takes off in his fancy car. When she discovers that she had witnessed the theft of a van Gogh painting, she reports it to the police. In the meantime, a stripper slash actress was murdered and her friend hires Tiffany (she's trying to pursue a career as a PI) to find out what really happened. As Tiffany investigates, she discovers that the two cases may be connected. This is the second in the Tiffany Black series and the first one that I've read by this author and I liked it. I haven't read the first one (but I'd like to) and it works as a stand alone. Written in the first person perspective (Tiffany's voice), I liked the writing style. It is a fun read and is at times sarcastic. There is some mild swearing. I liked the characters. Tiffany is addicted to cupcakes ... she's lucky her elderly neighbour, Glenn, likes to bake them for her. I think she would be fun to hang out with. Stone was apparently her body guard in the last book and keeps an eye on her in this one. He's a good friend and cares about her. Jack is a rich businessman who is interested in Tiffany but she hesitates. Tiffany's family is fun. Her mother is forever trying to hook her up with losers. Her grandmother just started dating Nathan, who is a lot younger than she is. Her dad just seems to go with the flow. We meet Ian, her neighbour, who is a dork but wants to be a PI like Tiffany. I would recommend this book if you are looking for a fun mystery. I do like a good mystery! !